This study regarding the fundamental research in silicone materials field used by facial prosthesis and implanto- prosthetic therapy. The aim of the study is concerned with the synthesis and analysis of a new siliconic material with various excess materials, these aspects being necessary because of the different types of underlaying tissue. We tests in same condition the mechanical properties of new materials and examination the stress distribution on residual alveolar ridge New silicone based materials having a higher biocompatibility as compared with those commercially available have been prepared and used for improvement of the removable dentures’ structure, but also for their lining. Held W., Silicones (2003) Their Science, Production and Major Qualities. Centre european des silicones - report january. 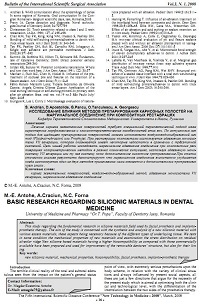 Zappini G., kammann A., Wachter W.(2003) Comparison of fracture tests of denture base materials. The journal of prosthetic dentiatry., 90(6):578-15. Forna N., Burlui V.(2001)Clinical guidelines and principles in the therapy of partial extended edentation, Apollonia, 470-477.